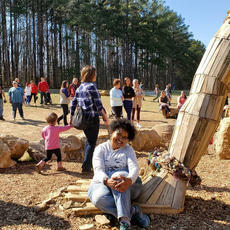 Bernheim intended for Thomas Dambo’s Forest Giants in a Giant Forest exhibit to attract visitors, but they were not prepared for the huge influx seen Wednesday as the weather became warmer and children were out on spring break. A photo shows a large crowd gathered around one of the Bernheim Forest Giants this week, as warm weather and spring break brought out an influx of visitors. The forest posted around 1 p.m. to its Facebook page that it would not be allowing new visitors between 1 and 3 because of the “high volume” of guests it was experiencing. Landon said the main issue Wednesday was the congestion of traffic not only within the forest and at its entrance, but also on major roadways. Traffic was backed up on Ky. 245 and also onto Interstate 65. “We had to let people get through and get parked before we could reopen,” Landon said of temporarily halting visitors. Bernheim anticipated a crowd for the giants, three large sculptures that opened to the public last month and will be in place for about three years. In fact, the forest recorded a 350 percent increase in visitors in March compared to the same time last year. 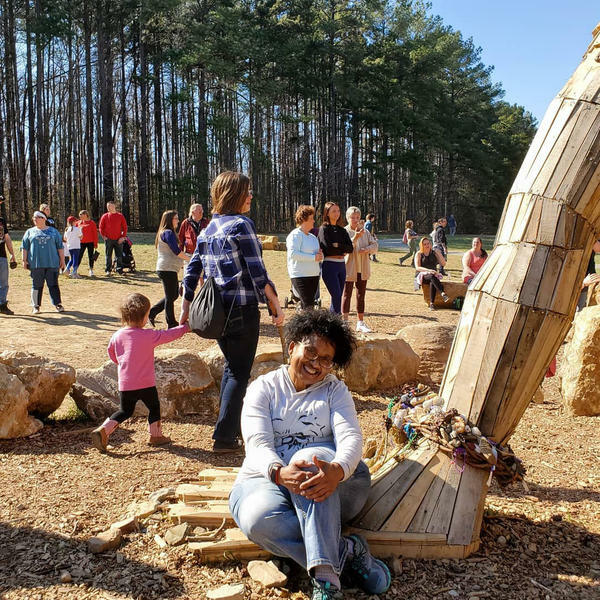 Adding to the crowd this week, many local schools are out on spring break and Wednesday fell in the middle of Bernheim’s Spring Break Week Adventure, which includes a number of family activities and promoted the giants as part of the experience. Landon said forest officials were thrilled to see such a community interest in the giants and the number of people wanting to come and see them, but Wednesday’s crowd still exceeded expectations. Landon said in her nine years with Bernheim, she has never seen an event or art exhibit earn such a crowd response, and she’s never seen the entrance have to close because of visitor congestion. While the gates reopened after a short time Wednesday to allow a new round of guests into the forest, officials are asking people to try and come at different times during the day for the remainder of spring break. Before 10 a.m. or after 5 p.m. are recommended. “We just ask for people to be patient and try to come at an off-time, that way it will spread the crowd out a little,” Landon said. And despite the crowd, she assured guests there were still places to “find peace” at Bernheim, on its trails and in other parts of the forest.